One of our favorite areas to ride is White Wash Sand Dunes between Green River and Moab Utah. It has open riding in the dunes, many trails surrounding them and plenty of space to camp. Two trails that we ride often are Brian's and Dead Cow Wash. Brian's is a good one to warm up on and starts at the end of the wash which in itself is a fun must do ride if you visit White Wash Dunes. We decided to combine the 2 trails into a bigger loop and show some newbies some of the best stuff in one ride. From the lower parking area we started by riding NE up the wash to where the wash ends and Brian's Trial Begins. You will know you are starting on Brian's by the black skid marks going up the slickrock coming out of the wash. The trail seems pretty well marked as you follow the white painted dashes on the slickrock. At the marked junction with Mary's Trail it follows more of a dirt trail to the road. We followed the road North towards the dunes until we came to the trail head to Red Rim which is an easy trail that leads to Dead Cow Wash. The best way to do the Dead Cow Wash Loop is counter clockwise, however it can be easier going clockwise for some. 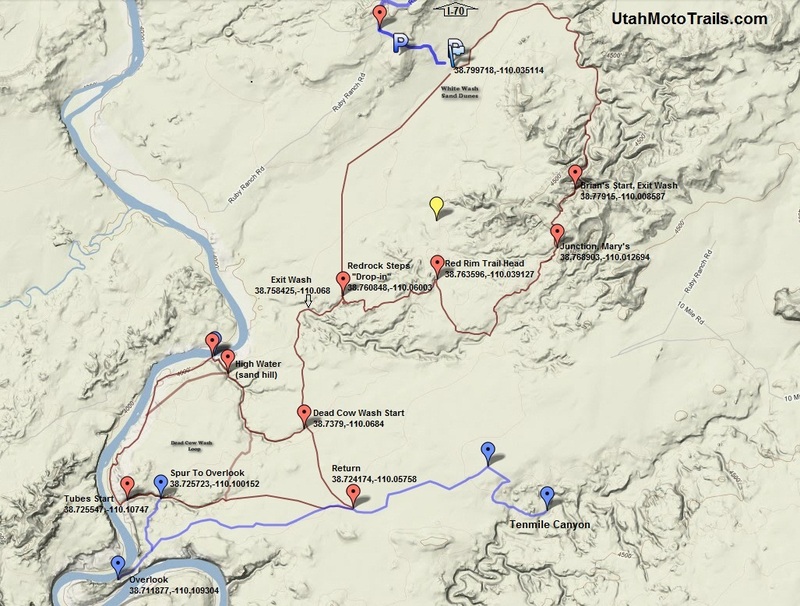 If you still need more after going down Dead Cow Wash and up The Tubes a good spur is to ride out to the overlook(marked in blue on the map). 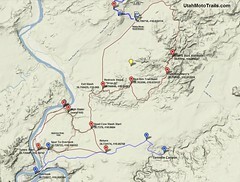 Another good, but longer option is to head out towards Ten Mile Canyon Trail, also in blue on the map. This time we simply did Dead Cow Wash and The Tubes, headed back the way we came doing the Tubes and Dead Cow Wash in reverse and returned up the wash to the parking area making the approximately 28 mile ride described here. There is a return route after going up the tubes, however it is just sandy road so we often opt to reverse after going up the tubes. Location: Near White Wash Sand Dunes (see map). Click for Directions To White Wash Sand Dunes from your location. 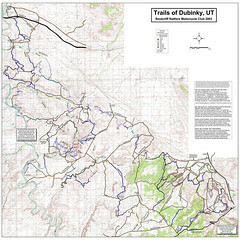 Make sure to pay attention to trail designations and closures. Some portions of Dead Cow Wash and all of The Tubes are Single Track and are narrow. 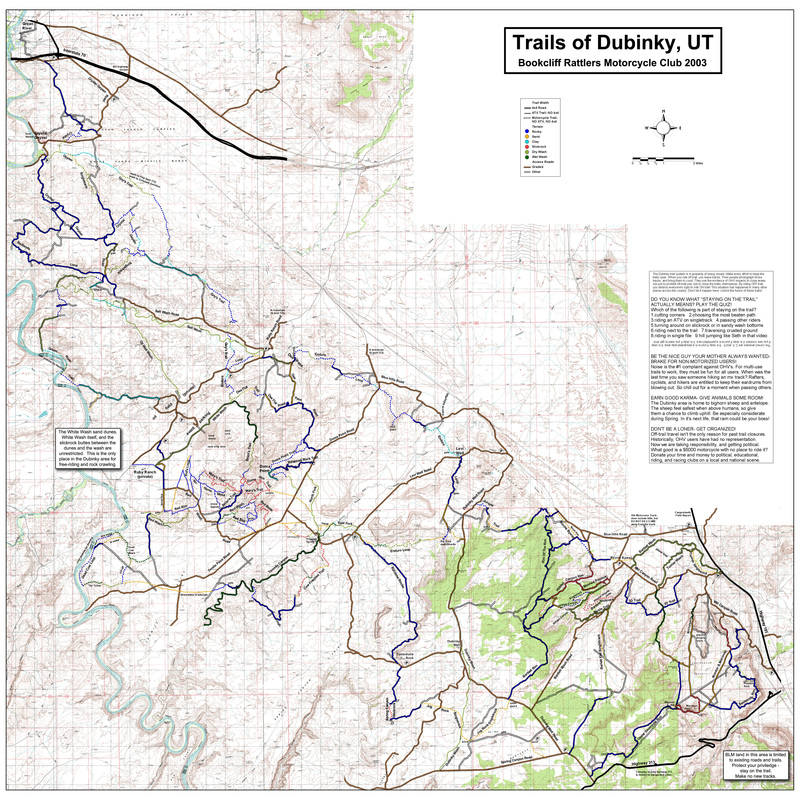 Some trails have been closed that are shown on the full trail map so don't assume it's open because it's on this map, check before you go and pay attention to existing signs.